In stock -This product will ship today if ordered within the next 9 hours and 53 minutes. 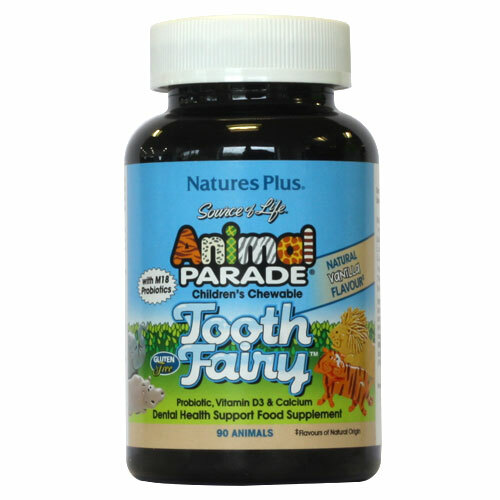 Nature`s Plus Animal Parade Tooth Fairy Children`s Chewable is the new supplement with live M18 probiotic cells, L.acidophilus, tooth-building vitamin D3 and calcium, and xylitol, which may reduce the risk of tooth decay! Delicious vanilla Tooth Fairy Chewables, in fun animal shapes, also contain a targeted whole food blend of natural tooth-friendly nutrients! Natures Plus Source of Life Animal Parade offers a cascading variety of luscious flavours, enticing textures and diverse formulations - making nutritional supplementation fun and easy for you and your kids. Featuring whole-food fruits and vegetables, along with other critical vitamins, minerals and nutrients, Animal Parade delivers superior-quality support for children`s healthy growth and development. Like all Nature`s Plus products, Animal Parade vitamins and supplements for kids contain only the highest quality natural ingredients to help your young ones. Sweeteners (xylitol), calcium carbonate, anti-caking agent (di-calcium phosphate), Lactobacillus acidophilus, anti-caking agent (stearic acid), natural vanilla flavour and other natural flavours, anti-caking agent (magnesium stearate), thickener (guar gum), Streptococcus salivarius M18 (milk), cholecalciferol, spinach (Spinacia oleracea) leaf, broccoli (Brassica oleracea) sprout, fig (Ficus carica) fruit and date concentrate (Phoenix dactylifera) fruit. As a dietary supplement for children two years of age and older, chew two tablets once daily. Keep tightly closed and out of reach of children. For maximum protection, do not store above temperatures of 21 degrees celsius. Below are reviews of Nature`s Plus Animal Parade Tooth Fairy 90 Chewable Tabs by bodykind customers. If you have tried this product we'd love to hear what you think so please leave a review. 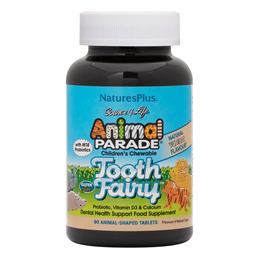 Nature`s Plus Animal Parade Tooth Fairy Children`s Chewable is the new supplement with live M18 probiotic cells, L.acidophilus, tooth-building vitamin D3 and calcium, and xylitol, which may reduce the risk of tooth decay!